Sydney (AFP) – A massive humpback whale buried on a popular Australian beach after it washed up dead was being exhumed Monday because locals feared its rotting carcass was attracting sharks. The 18-tonne animal came ashore entangled in fishing ropes last week at Nobbys Beach in holiday hotspot Port Macquarie on the New South Wales coast, 400 kilometres (240 miles) north of Sydney. Authorities tried to drag the 12-metre (40-foot) whale back to sea, but gave up when it became caught on rocks. With only a pedestrian pathway leading to the beach and no road access, the local council winched down a small digger to bury the dead creature. But concerns that oil and decaying blubber were seeping into the ocean soon sparked a community backlash, with a spate of shark sightings close to shore ahead of school holidays, when beaches in the area are usually packed. Under mounting pressure, the state government stepped in with enough cash to fund the removal of the decomposing animal. 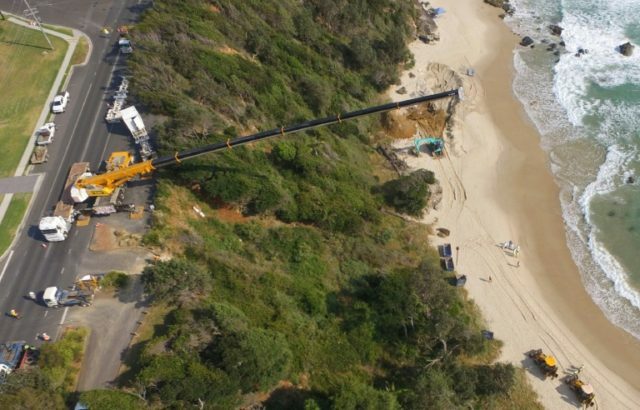 A large crane was set up on the cliff edge Monday and mechanical excavators lowered to the sand, where they set about digging up the carcass and ripping it apart to be taken to a landfill site. “We are using an excavator with big teeth on its bucket to actually cut the whale in pieces. It’s quite a job,” Port Macquarie council’s environment director Matt Rogers told reporters. Surf school owner Wayne Hudson said locals were delighted the council had acted. “The community got behind the idea of pulling out the whale carcass for a varied number of reasons and we went to council and respectfully asked for it to be removed,” he told broadcaster ABC. Each year humpback whales migrate north from the Antarctic to the warmer climate off Australia’s north coast to mate and give birth.